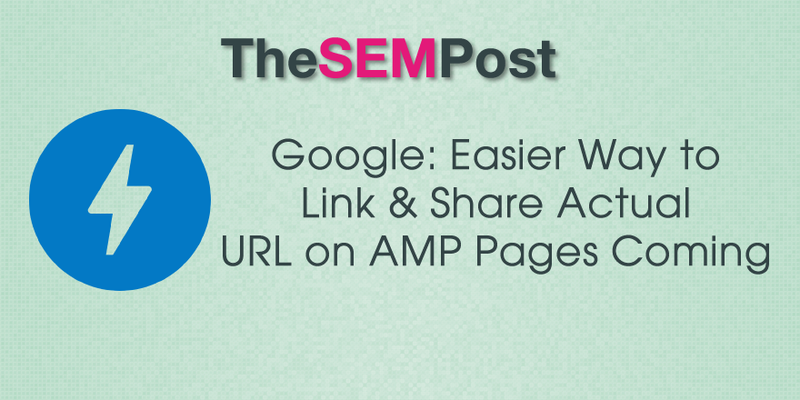 If you have tried to share a URL from an AMP article you have read in Google, chances are you have noticed that the link copied is a www.google.com/amp/ URL and not the actual URL of the source page. It is frustrating for many because it can obscure the actual site when the link is shared, and also some people end up linking to the Google URL, meaning some sites are potentially losing link value. Google has confirmed they are working on a changes that would see an easy link or access to the canonical page URL and the canonical URL for sharing as well. I frequently share URLs that Google Now surfaces in my search app, but they only have the Google AMP URL, and even the “copy URL” copies the Google AMP URL and not the link to the actual page. Some places where you share articles – on Twitter for example – it sources the correct destination site for the excerpt and image, while others it doesn’t. Then there is the issue of hackers hiding phishing links in AMP URLs. They are also making changes to remove the top bar that also displays on AMP – on Android it currently scrolls away and changes are underway for the same in Safari. Also, that top bar. It already scrolls away on Android and it will soon on Safari. Just working out some jank issues there. How soon the linking and sharing URL changes will come is anyone’s guess, but it is currently being worked on which is great news for both site owners and those that use AMP.